The first accurate map of the Fiji Islands. Chart of the Viti Group or Feejee Islands by the U.S. Ex. Ex. A beautiful example of Wilkes' 1840 map of the Fiji Islands. 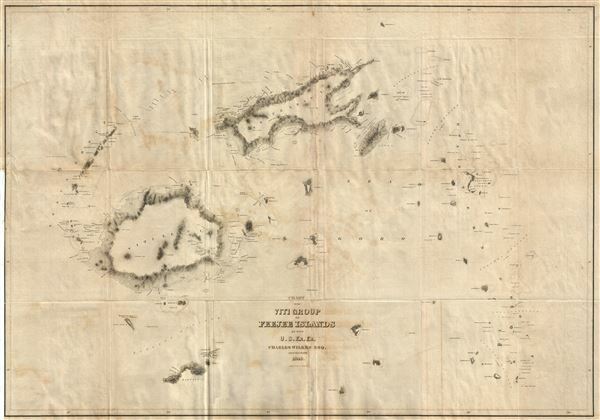 Considered to be the first accurate map of the Fiji Islands, this map includes three main islands, Vanua Levu, Viti Levu, and Taveuni as well as the Yasawa Group and countless lesser islands. Topography is rendered by hachure and shoals, reefs, and other undersea dangers are indicated with shading. A survey of faraway and little known Fiji, then known as the Cannibal Islands for the ferocity of its indigenous population, may seem an odd goal for an expedition funded by the U.S. Government, but completing it was in fact one of the primary stated objectives of the U.S. Ex. Ex. The Fiji islands were, at the time, the world's largest source of beche-de-mere, or sea slugs. Properly cured sea slugs were a considered a culinary delicacy in China where they fetched extraordinary prices. In the early 19th century the Fijian sea slug trade was largely dominated by merchant captains operating out of Salem, Massachusetts. In the twelve years prior to the launch of the U.S. Ex. Ex. eight ships, five of which hailed from Salem, wrecked on Fiji's little known reefs. The value of this risky trade prompted the United States government to step in and command a detailed reconnaissance. Wilkes had a particularly difficult time surveying the Fijian archipelago and lost several of his most valued me to the aggressive and highly territorial islanders. It was here, in retribution for an deadly attack on several of his most trusted sailors, that Wilkes reached the moral low point of his career when he commanded the Malolo Massacre. Eighty Fijians were slain. Rumsey 4442.003. Cowan I, pp. 248-249n. Cowan II, p. 683. Ferguson, Australia 4209. Forbes, D. W., Hawaiian National Bibliography 1780 - 1900: 1831-1850, 1573. Hill (II) #1866. Howes W414. Rosove, Antarctica 353. Streeter Sale 3324.